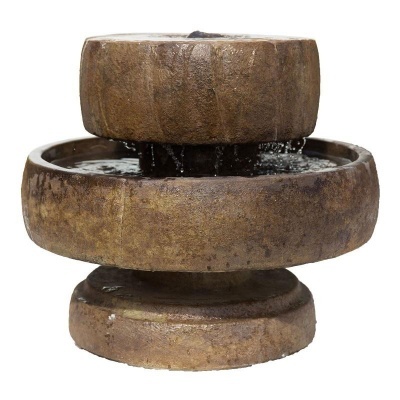 Henri Studio Small Millstone Water Feature fabulous cast stone three tiered fountain, offering the wonderful natural sound of water flowing and spilling over the rugged stone surface edges. Attractively authentic, with LED illuminating the shimmering water as it cascades over the levels. 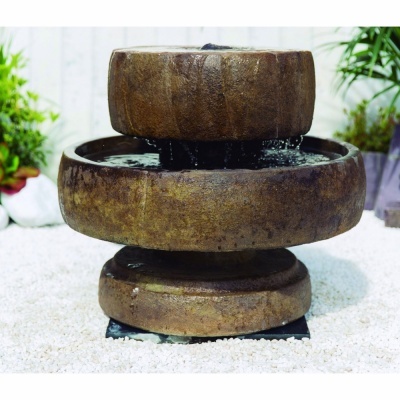 Henri Sculptors cast stone outdoor garden fountain inspired and hand finished in Relic Lava weathered tones. Water cascades to the base and re-cycles to the top ensuring no water supply is required, using the Henri re-circulating hi-performance pump (included). Large bubbling effect at the top of the fountain complimented with LED lighting makes this a joy day or night.